One look at the 141-foot (43-meter) Marcato, and you know this megayacht means business. Her rugged profile isn’t just for looks, either. She’s meant to tackle challenges. She did just that, with aplomb, with a team of researchers and conservationists. Thanks to her involvement with the International SeaKeepers Society, Marcato helped the team tag a record 30 sharks in the Bahamas. 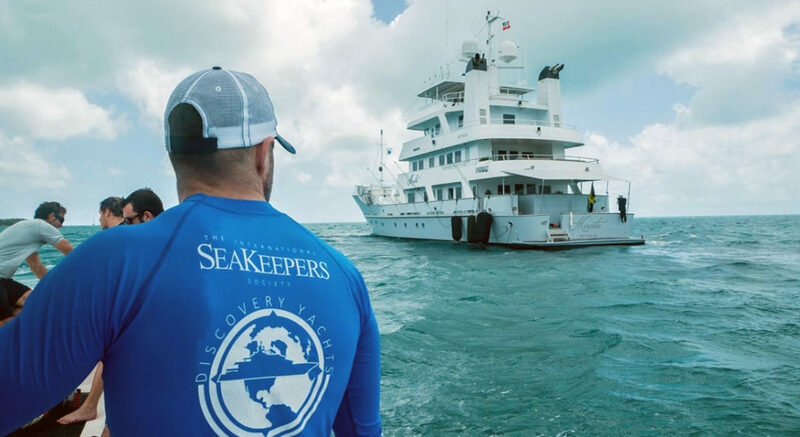 Marcato is one of numerous yachts participating in SeaKeepers’ Discovery Yachts program. Under this, owners and crew assist scientists with a variety of important tasks. Some are as simple as collecting water samples, for instance. Other tasks involve a larger time and resource commitment, such as scientist-led expeditions. This way, they can observe certain species they’re studying and collect data directly. Marcato joined Brennan Phillips of the University of Rhode Island and representatives from Beneath The Waves in the Bahamas in May. Beneath The Waves is a non-profit focused on conserving, protecting, and restoring the oceans’ health, through research and education. SeaKeepers’ staff was on hand, too. From May 1 to 6, Marcato and her crew helped them all tag sharks in the waters off the northern coast of New Providence. Tag indeed. Collectively, they tagged 30 sharks, a record. Further of note, among the 30, 11 were tiger sharks. Most of those tiger sharks exceeded eight feet in length, too. The numbers and sizes are significant. The Bahamas is a shark sanctuary, helping save several species from endangerment and, worse, extinction. Tagging 30 sharks in five days therefore proves the population is prospering. Scientists can then use the data to create similar sanctuaries elsewhere. Marcato and the researchers handled other important tasks besides tagging. They recorded morphological measurements, took blood samples, and took fin clippings. Each of these assists scientists in understanding how sharks behave and how healthy they are in the region. In addition, Marcato deployed underwater acoustic receivers, which will transmit data from acoustic tags on some of the sharks for several years. And, finally, Marcato helped deploy baited underwater cameras down about 3,280 feet (1,000 meters). SeaKeepers says these cameras have already provided researchers new information about deep-water sharks.